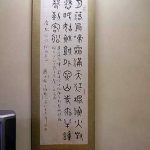 When you travel to Japan, you can stay in a hotel which provide modern services and building, or “Ryokan” which provides time-honored and unique services and old-style building. 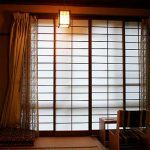 The standard material of ryokan building is wood and there are tatami rooms. 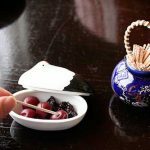 At such a Japanese style inn, the guests take off their shoes before checking in at the front desk and change into indoor shoes which are prepared by ryokan side. Usually there are ladies who give a thorough tour of ryokan and lead you into their room. 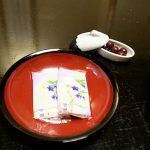 They are called “Nakai-san” and provide various services such as putting a futon in the room during you have dinner. Generally, the guests tip a nakai-san when she lead them into the room. This tip is called “Kokoro-zuke”. 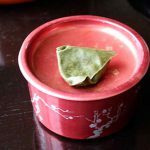 I think that an average rate of kokoro-zuke may be about 1,000yen – 3,000yen (it depends on how long you will stay or the status of the ryokan). This is absolutely up to you, not an imposition, so they would not provide poor services because you would not have tipped. 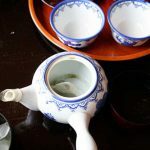 A “welcome set” is prepared on the table in which a teapot, tea cups, a tea caddy and some sweets are included in order to you can feel at home and relieve the fatigue after traveling. 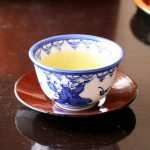 Welcome tea. Sometime a staff makes it for the guest. 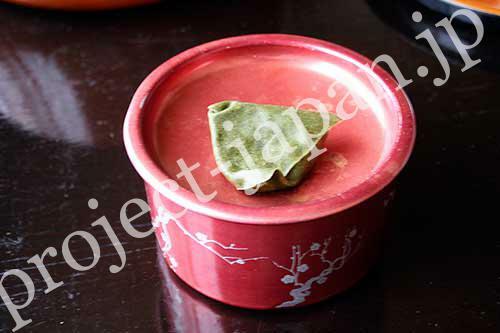 Usually, famous confections in the area are served. 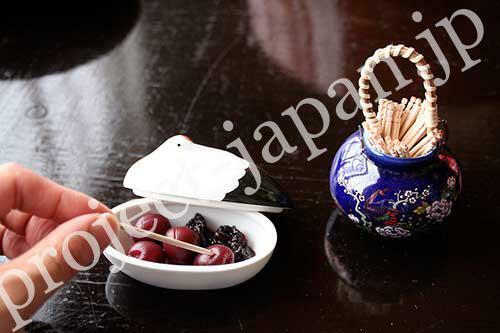 These are “umeboshi”, not sweet but salty. They add spice to sweets. 1. 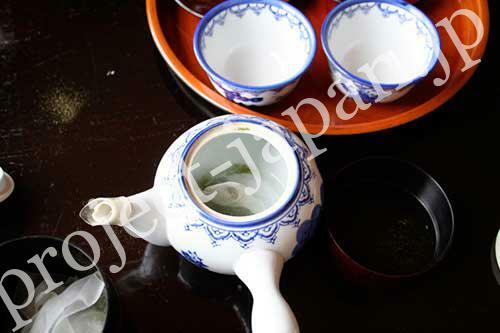 Put 1 or 2 teaspoonfuls of tea leaves into a teapot. 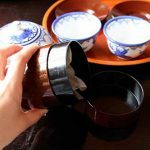 In case a teaspoon is not set or it is not teabag style, you had better put the leaves once into the lid of the tea caddy so that you can measure adequate quantity. 2. 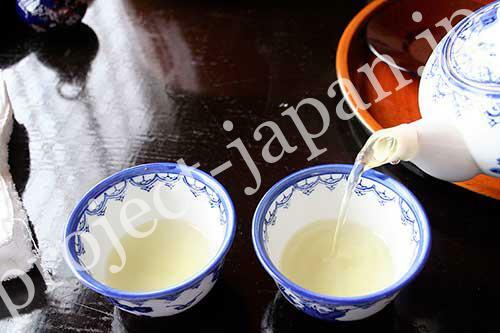 Pour hot water into the teapot and wait about 10 seconds. 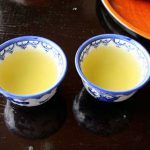 When you pour out tea into some cups, pour small quantity in the first cup. 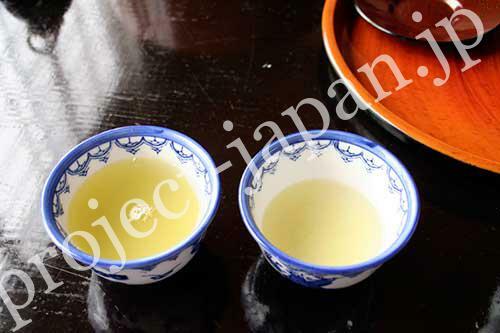 Then the more quantity in the second cup, the more in the third cup… in order to equalize the strength of the tea. 3. 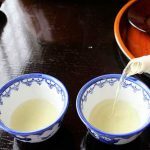 Equalize every cup of tea pouring out one after another. 4. 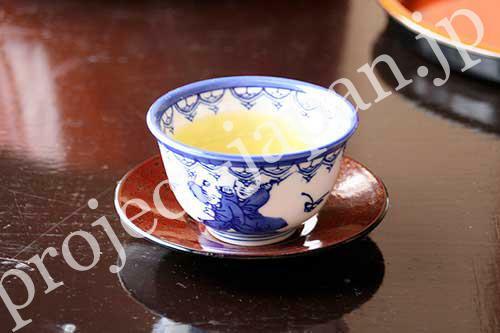 When you finished pouring, put the cup on the saucer and place the main design of the cup at the person who have it. 5. 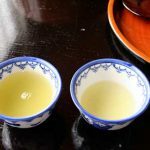 You can use same tea leaves a few times, and change the leaves in such a way. 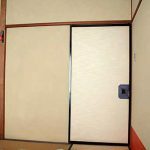 There are “Tatami”, “Shoji”, “Fusuma” and “Tokonoma” in a typical Japanese style room. Tamami is a hard and rectangular mat made of igusa rush. 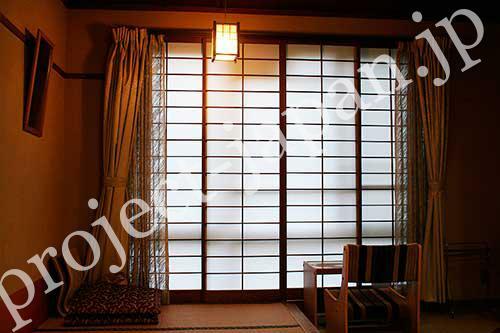 Shoji is a partition or a blind made of a wooden frame and white Japanese paper. 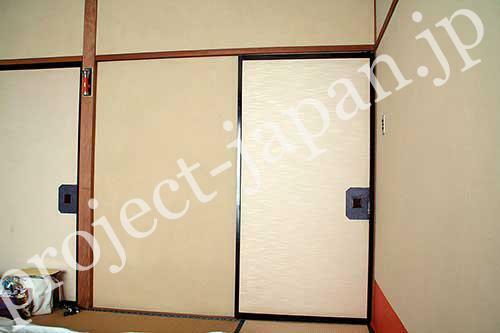 Fusuma is a partition or a door with the more thick paper on the both faces of the wooden frame. Tokonoma is a space which is a little high from the floor and flowers or “Kakejiku” (scroll picture) are displayed in. 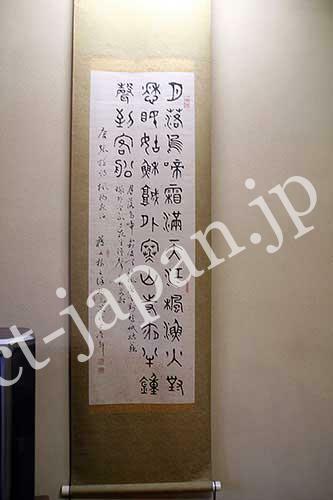 Tokonoma is to be found in a special room such as a reception room. 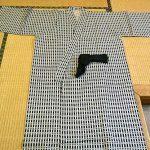 When you are in your room, change the cloth to “Yukata”. Wear the left body up lapping over the right in front and gird the Obi. 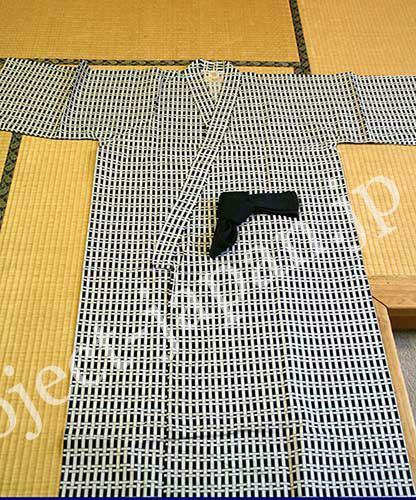 You can wear yukata all over the place and all time after checking in until checking out. 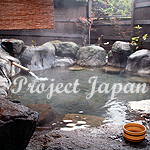 It’s easy to to put on and take off, so it’s very convenient to bathe in Onsen many times. 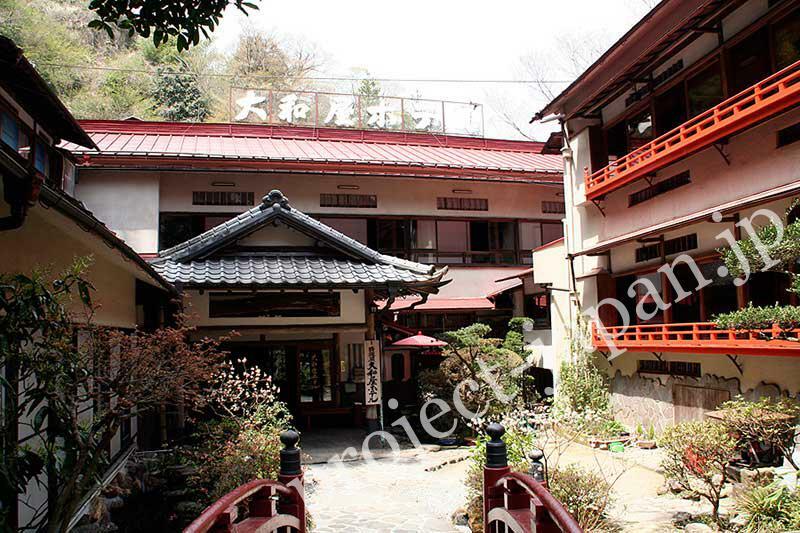 You can also go out to “Sotoyu”, which is a public onsen located outside of ryokan putting on yukata. 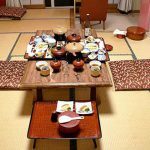 Meal is another delight during staying in a ryokan. The dinner time is usually set around 6:00 – 6:30 PM. 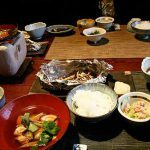 At some ryokan, you have dinner in the banquet room, or another, the staff carries the meal to your room. 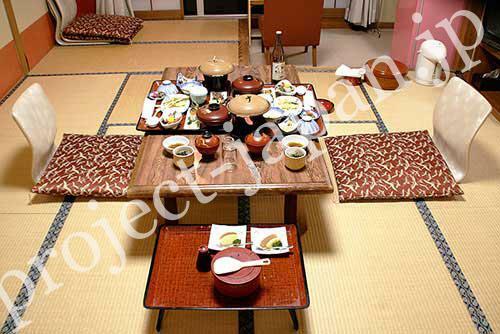 Futon is laid out by the ryokan staff during the dinner in the banquet room or bathing in onsen. 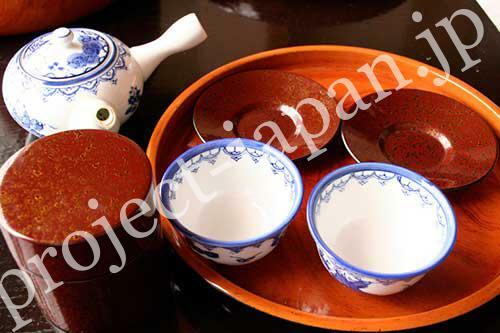 The cuisine is usually set out on the Japanese tray called “Zen” and placed in small dishes. 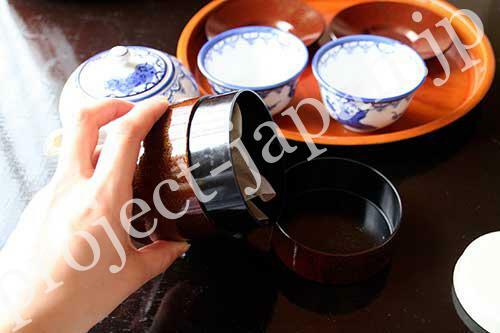 Special local products are served and general tendency, a steamed egg hotchpotch called “Chawan-mushi” and sliced raw fish called “Sashimi” are served all over Japan. 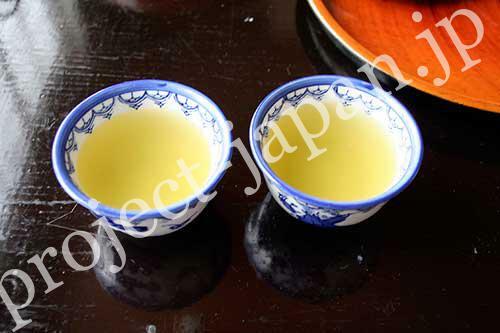 Of course, miso-soup is necessary in the Japanese meal. 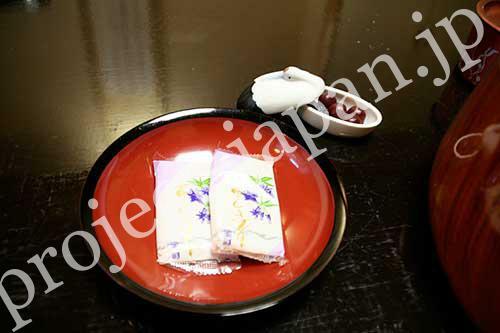 For breakfast, rice, miso-soup and dried laver seaweed are essential. An raw egg is served at times. Break it open in the bowl, beat it, pour soy source a little and drop it on the rice. 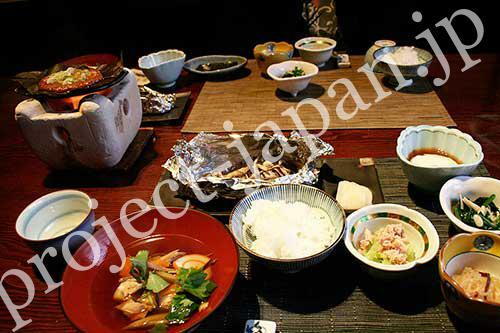 A grilled fish, pickles, fresh salad and rolled egg are common side dishes. 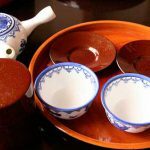 Onsen – What kind of Onsen do you go?